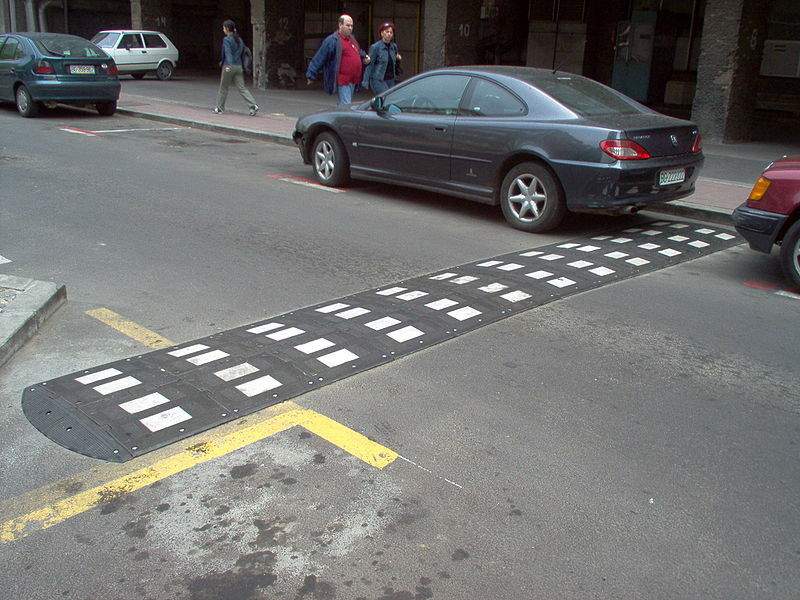 Speed bumps are designed to slow the speed of traffic, usually in an area where there is a lot of pedestrian traffic, neighborhoods with small children, or other factors which call for a decreased rate of speed. They’re usually easily spotted, painted yellow and/or reflectively, and are very effective in slowing us down and making us more aware of our environment. They’re frustrating, yes, but are a necessary evil in a society filled with vehicles capable of high rates of speed and driven by inattentive drivers. Occasionally, perhaps due to wear and tear, or perhaps in a design flaw, they aren’t easy to spot, blending in with the road surface to the extent that you don’t see them until you make bone jarring, teeth rattling contact with them. Those are the ones that are particularly frustrating, they ones you don’t see coming. I hit a speed bump this week in my quest to become leaner and faster. I didn’t see it coming and was taken unaware. Being an old broad who runs, it seems that something always hurts a little. But, typically, it’s a sore muscle or tired legs, nothing serious. Being an injury prone old broad who runs makes me err on the side of caution when I implement anything new in my training. I want to be that 93 year old woman who still signs up for races and always wins her age group (because nobody else her age is still alive and/or able to run-I’ll take a win any way I can get it). So, I take it cautiously. I try to never build distance and intensity at the same time, try to always abide by the “10% rule” when training, monitor my aches and pains with devoted intensity, and always run with a plan. Typically, when I have an injury, it’s my right IT band, which has been known to ping with annoyance when I turn over wrong in bed. But, this week, I hit one of those speed bumps that hides from you, one that springs up and knocks you flat when you least expect it. My back went out. Now, I have occasional back pain. Like I said, I’m an old broad who runs. Stuff hurts. Usually, after a soak in a warm tub and a good night’s sleep, I’m good to go. So, Monday night, as I carefully laid out my gear for the next morning’s speed session, I ignored the pain in my lower back. I did a little easy stretching, set my alarm, and determined it would be better in the light of day. Unfortunately, after a very uncomfortable night, morning arrived with no relief. In fact, I could barely move. I no longer resembled and old broad who runs, I was just an old broad. I’ll admit that tears of frustration filled my eyes and burned my throat. I just started rebuilding my training, with an eye toward being a little bit faster. Just a little bit. I’m not expecting miracles. But, I would like to be faster. I have dreams and goals, just like all runners. And, suddenly, getting out of bed was a Herculean task. Sheesh! Give me a friggin’ break! Now, if you’ll think back to Tuesday, you may remember the top news story of the day. A tornado did devastating damage to an area of our country, taking many lives, spreading destruction far and wide. As I steeped in self pity on my couch, sipping my coffee, I watched people whose lives had been destroyed, heroic teachers who placed their student’s lives above their own, and I got my perspective. This was just a small setback, a speed bump reminder. I reached for my phone, called my chiropractor, and went about my day. I love my chiropractor, Dr. Brian Page, and have great faith in him, because he is an athlete, and he realizes the importance of getting me back to the sport I love. After 3 days of visits, mulitple ice/heat treatments and lots of easy stretching, I’m headed back. I’ve had to revamp my training schedule, but that’s a little thing and nothing new. I rode my bicycle on Friday morning, a slow, steady ride. It was painfully slow, but the breeze from the wings of the butterflies that kept passing me at least made it nice and cool. 🙂 Took the dog for a nice, slow walk today, and plan to test the waters a little in the morning with an easy run/walk. Still stretching and icing, and mostly taking it pretty easy. No speedwork for me this week, indeed the act of moving from one room to another seems challenge enough. I’ll take it easy the next couple of weeks, build my mileage back up with easy walks and runs, then hit it hard again in about three weeks. The lesson? Pay attention to your body, don’t increase distance and intensity simultaneously, and remember I’m not a spring chicken any longer. Those speed bumps really hurt these days. 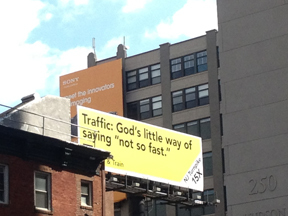 Billboard I saw on my runabout in NYC. I’ve become something of a computer techie. Only in a minor way, but if you are a professional photographer in today’s market, you better know something about computers. Most of my knowledge has been learned in the school of hard knocks, but I have traveled far and wide to increase my abilities and try to become more literate in a world that was foreign to me a very short time ago. One of the first lessons I learned was get the best equipment. So it was that I went out of the PC world and landed in Apple land. I immediately had fewer problems. But, as polished as my Apple was, it still had issues occasionally. So, I had to learn to troubleshoot. The first thing I learned was that when you have an issue, it sometimes resolves when you reset. Turn off, unplug, let it rest, then reboot. Problem solved. I try to always apply lessons learned in life to my running, and vice versa. When I found myself out of steam recently, looking frantically for my mojo, I knew just what to do. Press reset. So, that’s what I did. I’ve spent the last couple of months just running for pleasure. I turned off the competitive vibe, and let myself reset. I had some trips planned, had fantastic runs on them, ate way too much Italian food, drank quite a lot of wine, smelled a lot of roses, and now I’m ready to run. If running has taught me nothing else, it’s taught me how to press the reset button on my mojo. I’m ready. I’ve always been a runner who was more inclined to stop and smell the roses rather than to run for them, but I’m ready to test myself now. That doesn’t mean that I won’t continue to stop and smell the roses occasionally. It just means that I’m ready to be more intentional about my training. I’m ready to be leaner and faster. I’m ready to push. So, along those lines, I’m following a couple of different training plans. I’m easing into more mileage by adding a fourth running day to my week. Right now, that’s just an easy day, with two to three miles. But, I’m also adding an interval workout once a week. I had my first one this past week and, may I just say, “OW.” I think that describes the workout perfectly. I will continue to run long, but I don’t have another race scheduled until after Thanksgiving, and for that, I’m thankful right now. I’m sure I’ll pick up some short races between now and then, but I’m not going to plan those too far in advance. Right now, I’m concentrating on increasing my speed, decreasing my girth, and, yes, smelling the wonderful smells that spring in South Mississippi brings. So, there may be a few stops to smell the honeysuckle. And, of course, as a professional photographer, it’s almost impossible not to stop and take an occasional pic to commemorate the rites of spring. It’s so wonderfully green. But, I’m ready now. I’ve pressed reset, I’ve rested a few, and now it’s time to pick up the mantle and run. I love Mother’s Day. I’m not a huge fan of holidays that have been engineered by greeting card companies, but this one is nice. A day to celebrate our wonderful legacies, to let our moms know how much we love and appreciate them, to reflect on all that they’ve brought to our lives, and, yes, I’ll admit it, a day that’s all about me. I jest, of course. Mother’s Day took on new poignancy after my mom was called home in 2009, and the Mother’s Days since then lost some of their sheen. But, this year has felt different. Now that my Dad has been called home with her, the thoughts of her on this day simply make me smile. My week has been filled with blessings, starting with the new stereo system for my convertible Mustang that my man had installed for me (all the speakers work!). The highlight was a surprise visit from our oldest, who lives in Houston and drove in without telling her Dad or me that she was coming. She coordinated with our youngest, who came over to our house on Friday night in an effort to keep us awake until her sister got here. All of that was under wraps of course, and if you know our youngest, you know what a feat that was. Even at 24, she’s hard pressed to keep a secret, but she managed this one with flying colors. Our beautiful daughter waltzed in about 9 and my Mother’s Day was complete. We did something different by way of celebration this year, we cooked and had my in-laws over on Saturday. This had been decided earlier in the week, when Gary & I had no knowledge that Misty was coming in, or that she would only be here on Saturday. Got to love how God works things out. That one had me shaking my head with wonder, and asking Gary repeatedly if he knew that Misty was coming in. A wonderful meal, great conversation, and lots of laughs, then our Saturday evening worship service filled my day to overflowing. I can’t remember a nicer Mother’s Day, and I’ve had a lot of really, really good ones. So, that brought us to today, the actual “holiday”. I got another gift this morning, the gift of a free day. Now, you moms, wives, and daughters know how rare those are, so don’t be envious. We slept in a little, then I got up, made coffee, and leisurely read my Bible. Even the weather cooperated with my weekend, sunny and cool, allowing me to get a late start on my run. Those late starts will soon be a thing of the past, but I’m welcoming the warmer temps with open arms. So very ready to sweat! After my devotion, I checked Facebook updates, and they made me smile. 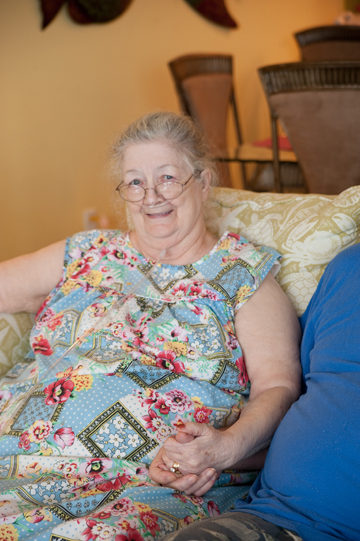 So many pictures of moms, some who, like my mom, have gone to their heavenly reward, others who are still with their families, tending their flocks even into old age. I will admit to suspiciously bright eyes as I read post after post, and saw beautiful images of mothers, daughters, sons, and grandchildren. But, happy tears only on this beautiful spring morning. After two cups of coffee and a helping of yogurt, it was time to run. I absolutely love having church on Saturday evening and running long on Sunday morning. The rails to trails that I run is almost deserted on Sunday mornings, and on perfect weather days like today, I get to have church again on my run. 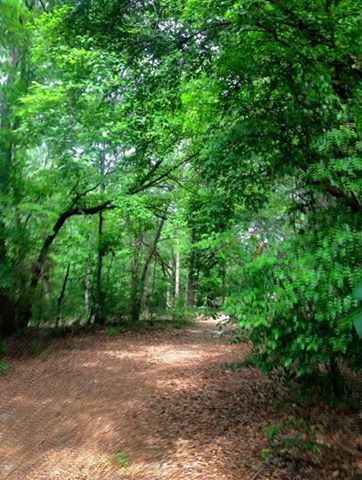 I started out on my usual route on the Trace, but when I came to the part that opens up to the trails that have been laid out across and around the track, I made the decision to hit the trails. 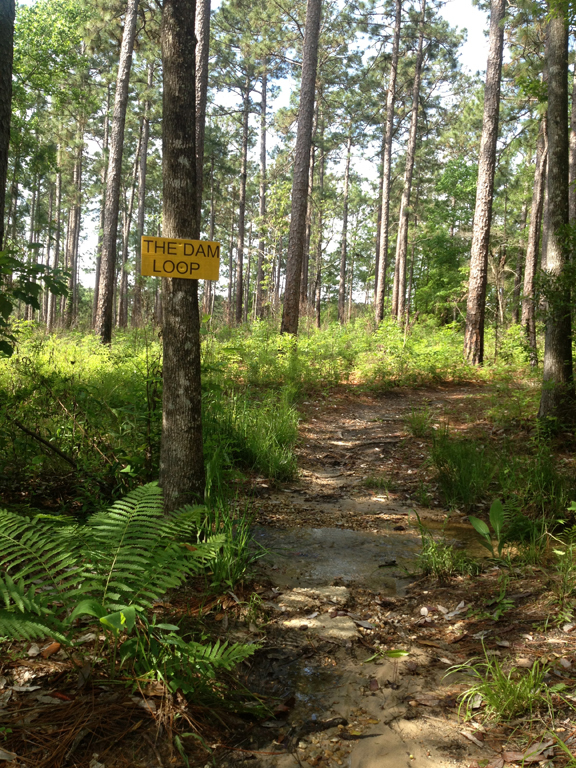 I love trail running, but don’t typically do it when I’m alone. I’ve never run the trails at the Trace, so I decided to have an adventure. I had nothing pressing to get back to, having had family lunch yesterday, so I decided to just run until I was tired, then head back. What started as a four miler became a six miler that was filled with wonder, worship, and prayer. Those are the runs I live for. They’re rare, but they give such a sweet gift that it lingers on the soul for months to come, a memory filled with promise, hope, and peace. Got a couple of pictures, got back on the Trace and ran the last mile and a half as hard as I could. 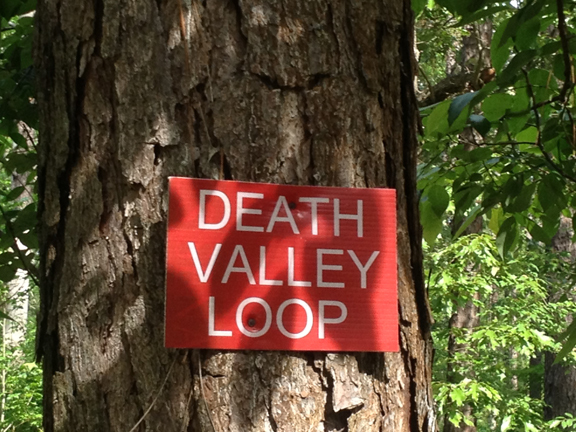 Loved the name of this loop! So beautiful this morning with the sun coming in and green as far as the eye could see. Thought I would save this loop for another day. Couldn’t leave without a word and picture about my sweet mom. Miss her so much, but very much at peace with her loss. After she died and my dad was still alive, I would dream of her often and always wake up with a feeling of unease. After dad passed away in January, I began to dream of them both, always together. I can’t remember the dreams when I wake up, but I’m always smiling and have a sense of peace. So thankful they’re together again. One of the last images I took of Mom, on the beach trip that my sister and I took them on. Whether or not you’re a mom, have a spectacular day today. Live, laugh, and love. Spend some time outdoors and embrace the ones you love.